California based Kevin Keller plays ambient music that sometimes incorporates classical influences, but is at its best when drawing on his love for film scores. Keller's web page details his interest in film music and claims the Star Wars and Close Encounters soundtracks as the first albums he owned. Much of the music consists of slowly developing ambient pieces and the tracks flow seamlessly from one to the next making this easy to enjoy as one large work. 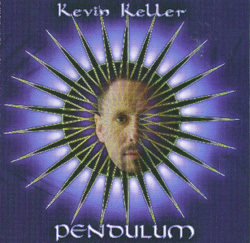 Pianist and synthesist Keller is joined by David Darling on cello and Jeff Pearce on guitar. Not all of the album's six tracks grabbed me but the ones that did worked well. "Arc Of The Pendulum" features single piano notes spaced apart by several seconds... some high notes, some low. The cello plays eerie drawn out notes but eventually takes on the lead role to produce an ambient/classical concoction. "Hall Of Mirrors" struck me as a sort of New Age minimalist piece. I liked the use of chimes and dissonant piano notes. It's a dark world we're visiting (or trapped in?) here and I can just see our heroine making her way down a mysterious hallway, danger lurking at every turn. I found the rest of Keller's music enjoyable and there are certainly some good ideas here. I'd be very interested in seeing a sci fi or fantasy film that he scored. But I was never able to lose myself in the music like I do with Lektronic label-mates Spacecraft, and at times Keller comes close to descending into New Age fluff. Still, ambient fans may find much to enjoy on this disc, particularly for Keller's use of instrumentation beyond the purely electronic. You can visit Kevin Keller at his web site.